Much has been written about Havana Cuba. It’s unique. With a chequered past. From Hemingway to the Mafia. Today it’s old American cars - relics of the 40’s, 50’s and 60’s. Classical architecture. A large number of neglected classical buildings with a sprinkling of partially renovated classical buildings. A mix of vibrant music and interesting people. An exotic merge of European and African. Massive men with massive biceps. Women with glutes that make Jennifer Lopez look like a ramp model. 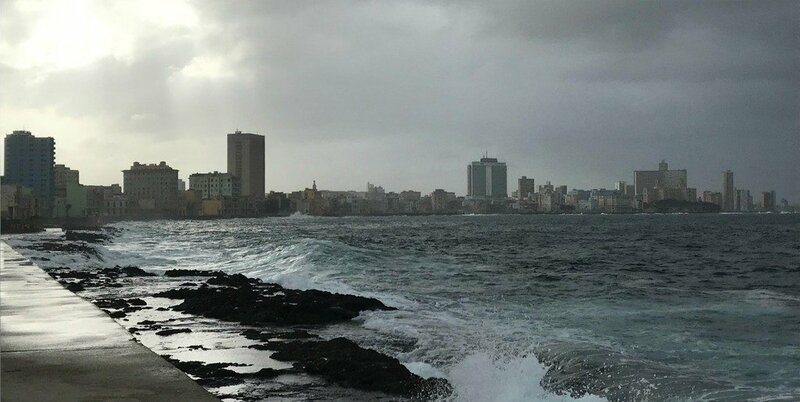 The Malecon (esplanade) is a mixture of the stunning, but many dilapidated, buildings on one side of the road and the crashing sea on the other. It’s confusing. It is what it is … but what could it be? There’s something missing. There lots to see. Many museums, many buildings and art galleries. Like many things in Cuba some are done quite well while others are shoddy, poorly signposted with inadequate information. Translations in English are available at some and not others. We decided to go on a foul day. It was raining on and off with a howling wind. We managed to see some sights and took a walk through the Vieja area. We bought our first ETECSA internet access cards and were introduced to our first internet park. We realised that from an internet point of view it was going to be a long three weeks in Cuba!! The museum follows the history of Cuba from the time of the Revolution in 1959. One fact I found interesting was that Che Guevara was an Argentinian trained physician. The story provides a very one sided, politically charged version of history. One section I loved. The “Cretin Corner” which features George and G W Bush, Reagan and their Cuban stooge Batiste. I wondered when Trump would be added? After visiting war museums in Japan, Vietnam and Cambodia. Seeing the indiscriminate damage done in Laos. It is easy to conclude that the US Department of Defence should still be called the Department of War. A large empty square overlooked by an imposing building and statue. In the evening large neon lights of the faces of Che Guevara and Camilo Cienfuegos light up the park. I was amused by the fact that after the people’s revolution the day we were there the people were not permitted up to the area of the Jose Marti statue. Signs and guards discouraged any entry. One interesting sighting we had on the trip was seeing the South African Embassy. There were a number of cars parked outside but very little activity and no people about. Havana represents Cuba. There is obviously a privileged class as can be seen from some of the very fine homes in pristine condition. But these are overshadowed by a large of decay. Wandering around I never felt threatened. There is a sense of community but also a sense of resignation. With conditions as they are it must be very hard to be motivated and positive about the future. Like many countries there is a lot of potential but to exploit it requires leadership.